Jonathan the Giant Tortoise, the oldest living animal at 184 years old, was given his first bath. 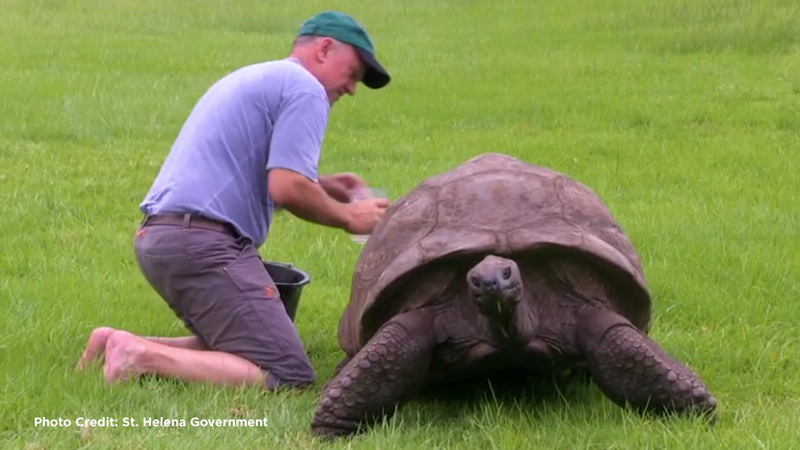 ST. HELENA -- After 184 long years, Jonathan the Giant Tortoise, the oldest living animal on Earth, was finally given a bath. The British territory St. Helena, a small island in the Atlantic Ocean about 1,200 miles off the southwestern coast of Africa, has been home to Jonathan for more than a century. Jonathan is held in such high regards on the island that he lives on the grounds at the governor's home. The average life expectancy of a giant tortoise is approximately 100 years, and Jonathan's caretaker, veterinarian Joe Hollins, believes he's lasted longer because of the cool winters on St. Helena. Jonathan is blind, has no sense of smell and can no longer detect his food, but Hollins said he has exceptional hearing. Now that Jonathan is squeaky clean, let's hope he won't have to wait another 184 years until his next bath. For more stories about animals, click here.